Mini Storage, Portable Storage or Warehouse Storage? Many people look for a mini storage unit when they need to store things, but there are also other options available for storage, and each has pros and cons. Mini storage units are garage-like spaces. The advantage of a mini storage is that you can come and go as you please, usually through a secure gate. The disadvantages are: you will need to rent a truck to move your things to and from the unit, and you will need to pad and protect your things from scratches (if you need to stack furniture). A similar but newer option is portable storage containers. This is a large container that can be dropped off at your home or business, and then moved either to a storage site or to a new location. The advantages to this option are: no truck rental is needed, it can be loaded and unloaded at ground level, access is easy if at your location, and you can take your time to load and unload it. The disadvantages are: access is not quite as easy if it is being stored at a warehouse, and you will need to pad and protect your things just like with mini storage. Yet another option is warehouse storage. This is offered by some moving companies. With warehouse storage, the items are pad-wrapped and loaded into large wooden crates (called storage vaults) where they are stacked and kept in an indoor warehouse. Some advantages to this option are: padding and wrapping of furniture is included, there is no truck to rent (unless you want to drop off the items at the warehouse yourself), labor is included, and the warehouse is completely secure. Disadvantages are: access needs to be scheduled in advance, and you will either need to transport the items to the warehouse or the mover can pick them up for you for a charge. If you need offsite storage where regular access is needed, a mini storage might make sense. If you need long-term storage and don’t need access to the items, warehouse storage is probably the best value. If you want to move without the hassle of truck rental or if you need extra storage space to de-clutter your home, a portable container will be perfect. 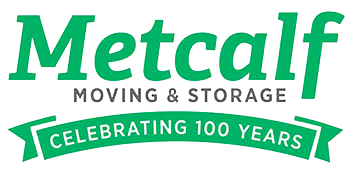 Give Metcalf Moving a call and with a little information about your needs, we can help you decide what will work the best!